CFS Review 9 DENVENTION on 4th, 5th, & 6th of JULY? Already there has been much controversy about the date the Denvention should be held. 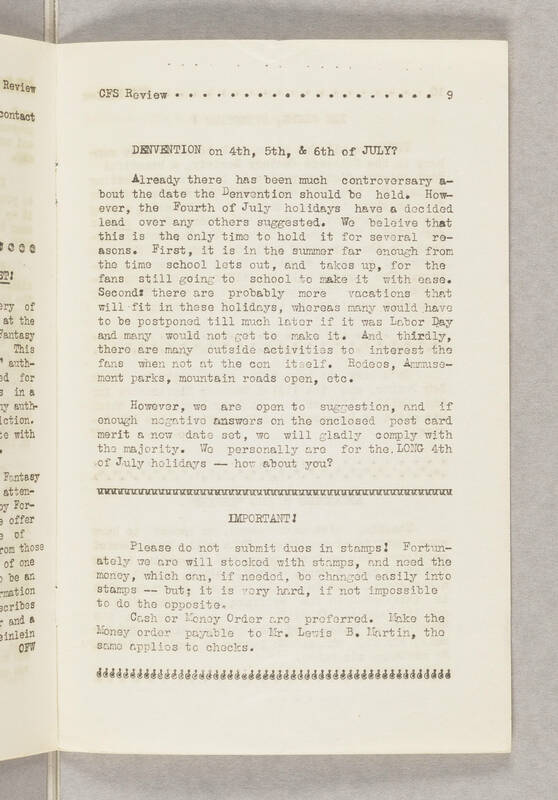 However, the Fourth of July holidays have a decided lead over any others suggested. We believe that this is the only time to hold it for several reasons. First, it is in the summer far enough from the time schools lets out, and takes up, for the fans still going to school to make it with ease. Second: there are probably more vacations that will fit in these holidays, whereas many would have to be postponed till much later if it was Labor Day and man would not get to make it. And thirdly, there are many outside activities to interest the fans when not at the con itself. Rodeos, amusement parks, mountain roads open, etc. However, we are open to suggestion, and if enough negative answers on the enclose post card merit a now date set, we will gladly comply with the majority. We personally are for the LONG 4th of July holidays -- how about you? IMPORTANT! Please do not submit dues in stamps: Fortunately we are well stocked with stamps, and need the money, which can, if needed, be changed easily into stamps -- but; it is very hard, if not impossible to do the opposite. Cash or Money Order are preferred. Make the Money Order payable to Mr. Lewis D. Martin, the same applies to checks.